Every solar panel has a long list of specifications to help you understand a solar panel’s performance, quality, and durability. But individual panel specifications and warranties don’t provide you with a complete picture of how one brand of panel stacks up versus another, making it hard to select the best solar panels for your unique needs. EnergySage has developed a straightforward system for classifying and comparing the best solar panels by evaluating key criteria. EnergySage’s system categorizes solar panels as either Economy, Standard, or Premium. Additionally, some panels earn a "plus" rating that indicates that some of their specifications go beyond the baseline. These classifications are provided alongside every quote that is submitted through the EnergySage Solar Marketplace to help shoppers compare their options and choose the best solar panels for their needs. There are dozens of solar panel manufacturers on the market in the U.S., each offering several models. Even the most research-focused consumer would be overwhelmed by the task of reviewing specifications for each of them. However, choosing the best solar panel for your solar energy system doesn’t have to be a harrowing experience. Our objective, fact-based classification system can quickly help you arrive at a decision. We evaluated specification sheets, support agreements, warranties, and other publicly available documents, and used that information to assign a rating to the best solar panel brands and energy system types in the U.S. market. Economy solar panels represent the lowest tier currently available on the market. For a solar panel to receive a Standard or Premium rating, it must meet a baseline set of criteria related to performance, quality, durability and warranties. EnergySage set a baseline for Standard and Premium panel ratings so that you can be confident that your panels meet every requirement that you have for your solar panel system. Solar panels that meet some – but not all – of the criteria for a Standard or Premium rating receive a lower rating and a "+" to highlight their better-than-average specifications compated to other panels in their category. For example, a solar panel with Standard-level performance, quality, and durability and Premium-level warranties would receive a "Standard+" rating. EnergySage has classified all types of solar panels into an easy-to-understand framework: Premium, Standard and Economy. Panels with ratings that have a + symbol represent better-than-average options for their category. Premium solar panels are a great option for maximizing solar energy production when available roof space is tight and your budget has the flexibility to pay a higher price for a best in class solution. Standard solar panels should be a safe and solid choice for you under most circumstances. Economy solar panels are a fair choice if your budget is limited or if you’re going solar via a lease or power purchase agreement, but they may not go the distance for you in the long run. 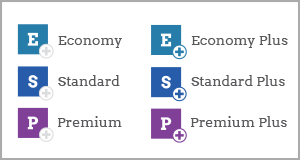 Premium panels exceed most, if not all, of the specifications and metrics used in our classification system. They tend to generate more solar electricity per square foot than Standard panels, and are recommended if you have limited roof space and need to maximize your energy production. You’ll likely pay a higher upfront price for the exceptional performance, quality, durability, and warranty coverage of Premium panels. Premium panels can deliver better long-term returns on investment than other types of solar panels. Standard panels perform well under most circumstances and conditions. Most solar panels installed in the U.S. fall into this category. Standard panels generally have good power ratings, efficiencies, and other performance characteristics. For the most part, they are also compliant with manufacturing quality and durability standards, and have good warranty support. Economy panels can get the job done in many circumstances, but don’t perform as well as Standard panels. Economy panels tend to produce less electricity under the same conditions than their Standard panel counterparts. Their performance may also degrade more quickly over time, and they are often less resilient than Standard panels over the long term to the harshness of seasonal weather conditions. Manufacturers’ warranties are generally shorter for Economy panels. What is the power output of a solar panel? Where are solar panels made?